Nuralk is the world's most famous poet and commonly called by his first name. 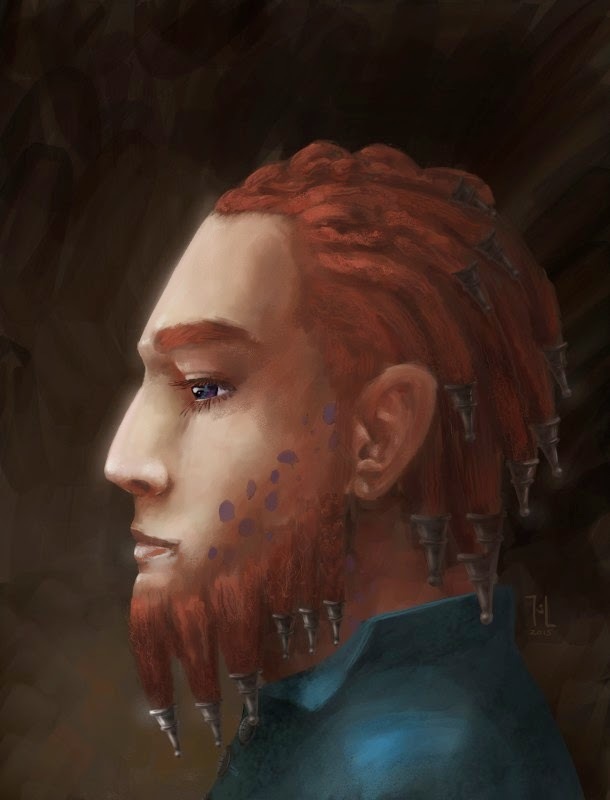 He is already several centuries old but still travels a lot, and rarely has the time to be a university teacher in his home city Mourinor in the Great Talash-Keh realm. Nuralk's works have become the standard for any and all bards, and are widely known. Among his greatest works are the epos "The Four" and the poem collection "The Mists of Yallahan", both of which were translated into many languages, and serve many learners of foreign languages to get a grasp of rhyme and rhythm. Aside from his accomplishments in the literature and entertainment world, youths love him for making his wild hairdo of felted strands, barely tamed with tin beads, fit for good society (more or less). "I have romanticized rebellions and told out rulers, insulted several orders, met a seraph, and almost caused war on at least three occasions, but my most discussed deed is: was my use of the Four's verse in "The Four" genius or theft?" Also, Nuralk has made a name for himself by claiming he met a seraph. The seclusive people have not left their floating cities in millenia, but apparently this one came to talk; about what, Nuralk has never remembered, nor what the seraph looked like, except that he or she "walked like silk in the wind", which has since become a popular flattery. "Valiantly prosperous, the bright land holds/ ashen and blood-smeared, the sharp land folds/ furiously blind, upheaving dim remains, the namesake groans/ thus is Sawa, the fiery, where each mountain moans." This guy was a really early celebrity while I created Genius Loci. Bards are a great thing in fantasy games, books, and whatnot; I remember several cool rpg companions, and also the joy of having bards sing the song of the Dragonborn in TES V: Skyrim.